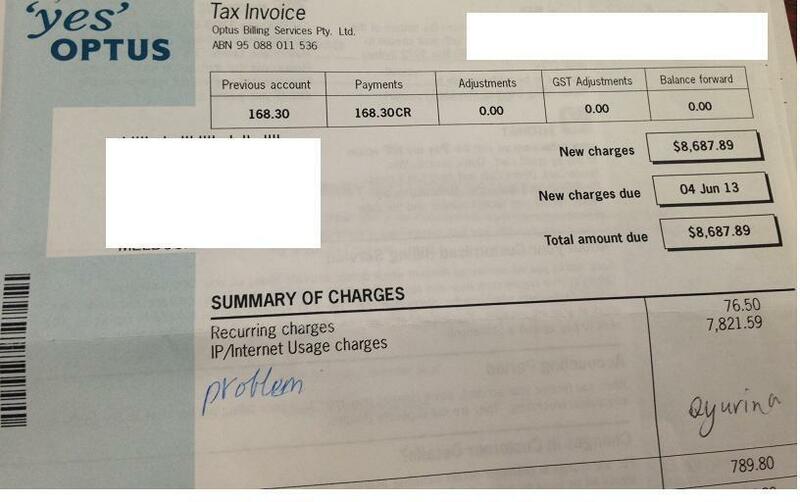 I have a friend that received a massive bill for excess usage charges. They were suitably shocked as they had been using the same plan for over three years and never gone over their quota, all previous bills were for $85. The service was provided as a bundled service with office phone lines and a 1300 number and they were told would be adequate for their usage. They were never told of their plan included quota let alone shown how to check it. They were not warned that that they were over quota and Optus had not restricted the service when the bill was almost 100 times more than normal. There has been multiple phone calls and emails they offered a 50% credit off the excess usage for April which would be a credit of $3910.79 + GST., which is still a bill of over $4000!!!! which is normally $85. I have only recently had similar dealings with Telstra with mobile phone excess charges for another friend and was pleasantly surprised that it was sorted out with one phone call. It feels we have been give the runaround and threatened with legal proceedings. I would assume that a customer that spends $400-500 a month on exclusively Optus services would be treated better. I assume the next step would be contact TIO and ACCC, has anyone gone through any of this with VCAT? Any advice would be appreciated.